I geeked out last night organizing my Trapper Keepers (I am an 80’s child so they will always be Trapper Keepers to me). I bought three binders, the largest I could find. I bought divider tabs, folder divider tabs, plastic protective sleeves, index cards, and just about every organization tool I could get my hands on. I do have a lot of information to process and synthesize. At times, I have been frustrated that this project is taking so long, but I always have to come back to the fact that the story has to simmer. It takes time. This is brown rice people. It is worth the hour on the stove. But when it flows, it flows. I have surges (and because I am a mom to young child, these surges usually take place at night). And last night, I only meant to clean off my desk that had open binders, sticky notes, index cards, pencil shavings, books, and a sea of other historic time period items. I have a book that contains material from 1921 and it is so delicate that when I open the book, scraps of paper flurry onto my desk. I received it through an inter-library loan. I have a helper I have enlisted at the local library. His name is David and he has helped me gather many newspaper articles and books through inter-library loan requests. He has been so helpful that he will surely make the acknowledgement page. It feels like I am living in the early 20th century as I am so deep in the research as my focus (and obsession) has been the Community Kitchen. My husband said the other day, “I appreciate your passion and enthusiasm, but I am Community Kitchened out.” Oh my, I thought, even my husband has had enough of this story. But you see, I will never have enough of it until it is written and bound in a book. It fascinates me. It takes me on jaunts and journeys to 1880 Spokane, where my great-grandmother was a teacher. Then I hop on a steam train with my great-grandfather heading West to Spokane from C armargo, Illinois. It take me to 1906 Texas where my great-aunt Harriet and grandma are dressed in Mother Hubbards — a red one for Juney and a blue one for Harriet, where they help their grandmother churn the butter. It takes me to 1926 New York City where my grandmother is the manager at one of Alice Foote MacDougall’s tea rooms. It takes me to 1943 Smith College where Mary Liz can’t come home for her Granny Dell’s funeral because of the war. You see, The Community Kitchen is my stage coach back in time. My 1920 Ford. It is my ticket to see my family’s shows and acts. I love it. I can’t get enough of it. 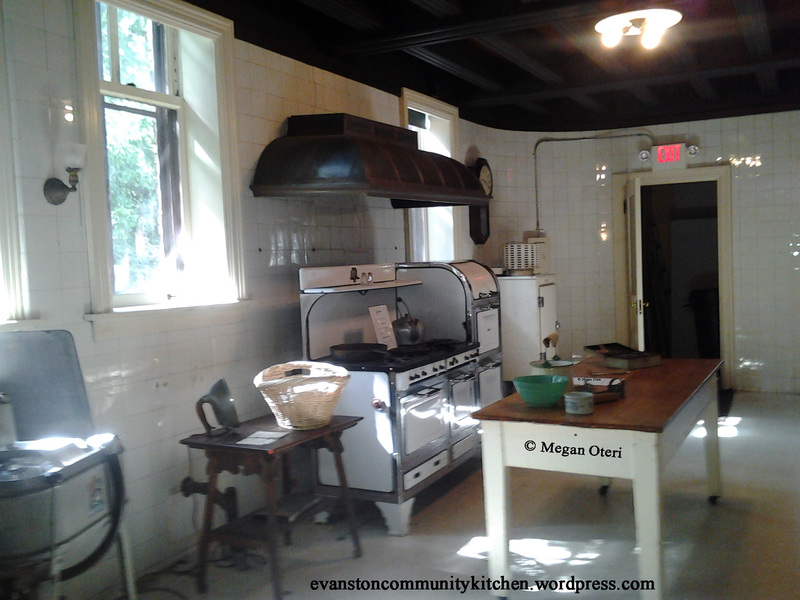 The story of the Community Kitchen, which evolved from an Evanston Woman’s Club food conservation committee in 1918, has so many other stories embedded in the tapestry of American history and family history. There are recipes, stories, and love surrounding this tale. And I am a happy chef in my kitchen of words, memories and translations of text my ancestors wrote, leaving me clues to tie a bigger story together. Sometimes (OK, a lot) I take out my index cards, which are filled with dates, facts, and anecdotes, and look them over. This gives me great comfort and joy as I have chronicled 1880 well past 1951. I have three binders full of research, which I have organized. The story is taking on a good shape – a shape of its own. The bread is rising and the scent is sweet. Being alone, while everyone sleeps, gives me great joy. I would rather research and write than go out on the town. I become entranced at night, usually staying up until well past midnight. My son starts pre-school this week so I will have to start going to bed earlier. I will do my writing during the day. But I have to admit that the night is much more alluring as I feel it provides a more daring environment and less distractions. On that note — good night. I am up well past midnight again. Today’s treat and tea — I transcribed (retyped) a letter written on my great-grandfather’s business letterhead to my great-grandmother’s (Granny Dell) sister in Connecticut dated May 1896. I wrote 6,000 words as well. I also had ice cream for dinner. Sneak peek for this week’s post about the excitement of coming upstairs from the basement research room when the Dawes House (Evanston History Center) was empty. It was like stepping back in time. This week’s post will focus on the kitchen at the Dawes House. If you are enjoying Downton Abbey like me, then you will enjoy this week’s post. Categories: Uncategorized | Tags: American History, bakers, chefs, churning the butter with grandma, cooks, Downton Abbey, Evanston History, Evanston History Center, evanton, Food, food history, foodie, foodie fanatic, Grandparents, great-grandmother, great-grandparents, historic kitchens, ice cream for dinner, kitchen, Mother Hubbards, organizing research, railroads, research, steam trains, trains, traveling back in time through research, writers, writing, writing about historical time periods | Permalink.